Today, WHO/Europe launches the road map to prevent and combat multidrug- and extensively drug-resistant tuberculosis (M/XDR-TB) for the 53 countries in the WHO European Region. The road map details sets of actions for countries, WHO and partners, as well as providing a framework for comprehensive monitoring and evaluation, to ensure accountability and measure the progress towards prevention and universal access to diagnosis and treatment. Based on a five-year action plan, developed through broad consultation and endorsed by Member States in September 2011, it also has clear milestones and a budget costing and analysis. The launch is taking place on the first day of the International Forum on MDG-6 in Eastern Europe and Central Asia, on 10–11 October in Moscow, Russian Federation. M/XDR-TB results from inadequate treatment of TB and poor airborne-infection control. Of the 27 countries worldwide with a high burden of MDR-TB, 15 are in the European Region. Recent surveys indicate that, in some settings, up to 40% of new TB patients and up to 70% of previously treated patients may have drug-resistant TB. Of an estimated 81 000 people in the Region with MDR-TB, only one third are notified, due to limited laboratory capacity and only two thirds of these are reported to receive adequate treatment. If the new road map is followed, it is calculated that interrupting the spread of MDR/TB would save 120 000 lives and US$ 12 billion. 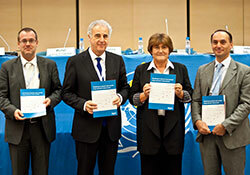 The road map helps countries to implement the new consolidated action plan to prevent and combat M/XDR-TB in the European Region, which WHO/Europe developed in consultation with Member States, stakeholders and communities. The International Forum is a high-level initiative that aims to mobilize governments, civil society and the private sector in eastern Europe and central Asia to achieve MDG 6 (to combat HIV/AIDS, malaria and other diseases by 2015). WHO/Europe has an active role in the Forum, with Ms Zsuzsanna Jakab, WHO Regional Director for Europe, chairing a session on 10 October on achieving the targets of MDG 6 and giving a presentation on the progress made in central, eastern Europe and central Asia in plenary on 11 October.